When vacationing in the South of Luzon, the buko pie is the region’s ubiquitous pasalubong. Perfect for sharing, the buko pie is commonly a 9-inch double-crusted pie stuffed with young coconut custard. But as perfect a pasalubong it is, there’s only so much buko pie you can eat. 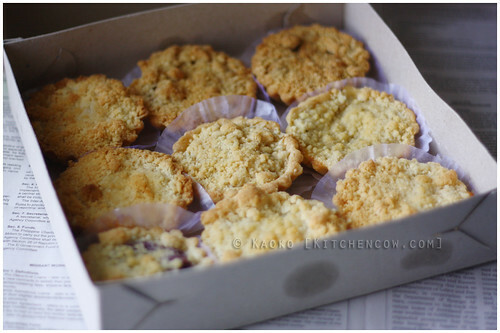 Thankfully, the enterprising pasalubong store Rowena’s has re-imagined the pasalubong process with Rowena’s tarts. 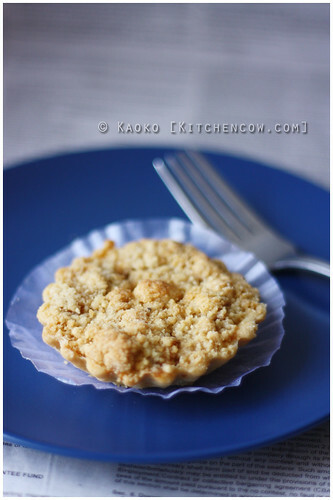 Instead of the usual large buko pies, Rowena’s offers 3-inch mini-tarts that are perfect for solo snackers. The tarts are available in a variety of flavors that include buko, apple, mango, pineapple, ube and blueberry, lessening the chances of flavor fatigue from too much buko, at the same time offering a little something for varying preferences. A box to share. Or hoard for yourself. Rowena’s tarts are layered with a crust on the bottom, a lightly sweetened fruity filling and a crumbly top instead of a second crust. These make for tender pastries that are lovely to bite into, then reward you with a soft filling suffused with fruity goodness. My personal favorite is the mango as the hint of acidity complements the sweetness well. The other flavors—like the buko, apple and pineapple are good, too. I must confess on skipping the ube as I’m not too fond of ube-flavored desserts. Remember this box. It spells yum. Aside from the tartlets, they also carry an assortment of your favorite pasalubong goods. If you’d like to take a short break, some of their outlets also have a small cafe, letting you take a break from your long drive home. 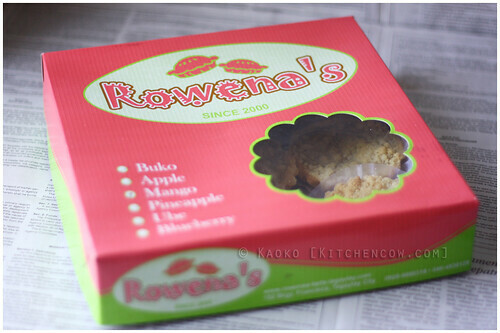 Next time you’re passing through Tagaytay, skip the endless identical buko pie shops and try Rowena’s instead. Just don’t forget to bring home extra boxes to share with your friends. This entry was posted in food spotlight, food trips and tagged Batangas, buko pie, buko tart, fruit tart, rowena, rowena's, tagaytay. Bookmark the permalink. Heeeeey, ala mode sounds like a good idea! And it’s probably something I should try next time. I linked it back to this page of course. Do let me know if you’re not amenable with this and I’ll remove it asap. Not a problem, Christian. I appreciate you letting me know. Nice post, btw.